PARIS — Airline connectivity provider Gogo Inc.’s decision to go all-in on satellite capacity to broaden and strengthen its ground-to-air Internet service now covering North America is the latest sign that 2015 and 2016 are likely to be the breakout years for satellite-delivered aircraft broadband. Itasca, Illinois-based Gogo, seeing competitors including Inmarsat, ViaSat, Panasonic Avionics, Global Eagle Entertainment and others move aggressively into aeronautical satellite broadband, is counting on its 2Ku service to expand its reach into Europe and Asia. 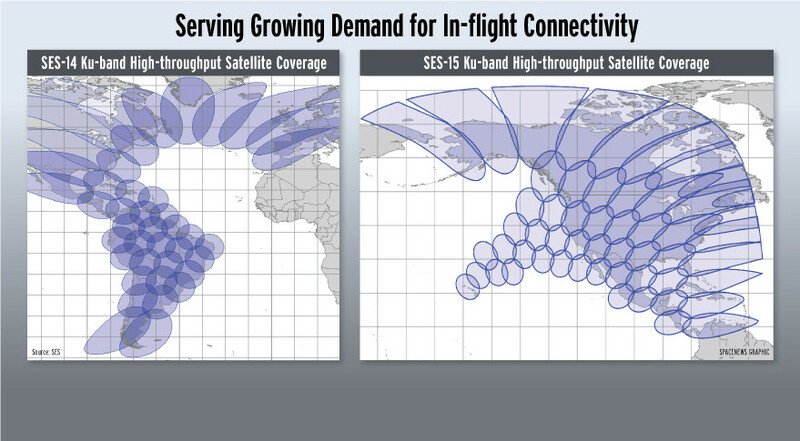 Gogo has purchased large chunks of bandwidth on Ku-band spot-beam satellites owned by SES of Luxembourg, and Intelsat of Luxembourg and Washington. The satellites will be in service in the coming 18 months. The 2Ku service employs two flat-panel antennas per aircraft, one for transmission from the aircraft and the second to receive data from the geostationary-orbiting satellites. In a March 3 presentation to investors, Gogo said 2Ku can provide 50 megabits per second of throughput with existing satellites, and up to 100 megabits per second with the new spot-beam spacecraft that employ frequency reuse. 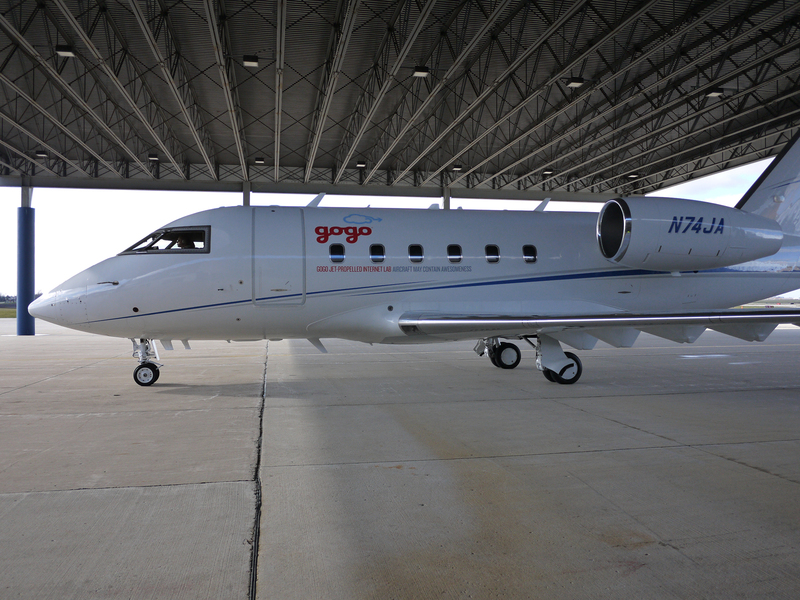 Gogo Chief Executive Michael Small said the company would gradually remove its current higher-end ATG-4 equipment — which transmits and receives data from terrestrial towers — from aircraft adopting 2Ku. For Gogo, he said, it was an obvious decision. Gogo is also a customer for London-based Inmarsat’s Global Xpress Ka-band mobile service, which is expected to be available globally later this year with the launch of the third Global Xpress satellite. 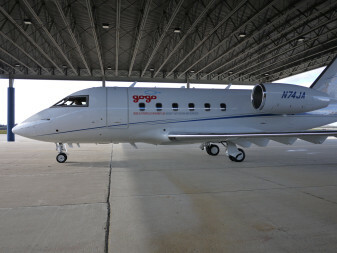 Gogo said Global Xpress, for which it is a distribution partner, should be capable of providing a 50-megabits-per-second service to commercial aircraft. 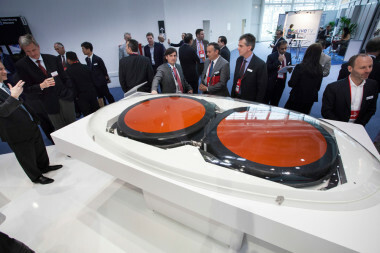 Gogo has been a regular customer of Inmarsat’s L-band Swift Broadband service and of mobile satellite provider Iridium’s L-band service as well. Gogo’s Iridium service delivers data at 2.4 kilobits per second. The Inmarsat Swift Broadband is up to 432 kilobits per second. Iridium Communications recently announced a suite of higher-throughput offerings. Gogo in February signed a 10-year, 250-aircraft contract with Delta Airlines for 2Ku in February. Small said the Delta order brought to 300 the total number of aircraft committed to 2Ku. In its investor presentation, Gogo said it has a 69 percent share of the airline connectivity market in North America when measured in aircraft already equipped, with 2,098 planes. Global Eagle was second, with 524 planes, followed by Thales/LiveTV’s 269 and Panasonic Avionics, with 152. Global Eagle of Los Angeles has also signed for large amounts of Ku-band capacity on several commercial satellites, including SES’s. Panasonic Avionics of Lake Forest, California, was one of three inaugural customers for Intelsat’s Epic high-throughput Ku-band spot beam satellites, to launch starting in early 2016. Panasonic in 2014 purchased most of the high-throughput Ku-band capacity on the Eutelsat 172B satellite, to be launched over the Pacific Ocean region in 2017, giving Panasonic global coverge in Ku-band. In addition to Inmarsat’s Global Xpress, the Ka-band side of the aeronautical broadband picture features ViaSat of Carlsbad, California, and its Exede in the Air broadband service, which has secured JetBlue as a major airline customer. Viasat has partnered with Paris-based Eutelsat on a roaming arrangement that will provide seamless coverage in North and Central America, the Caribbean, the North Atlantic air routes and throughout Europe. Gogo said that once the SES and Intelsat spot-beam Ku-band satellites are in service, its 2Ku service will offer broadband at half the cost, on a per-megabit basis, of the competing offers using traditional Ku-band satellites. Making the picture more complicated is that just as Gogo has moved from a ground-to-air offer in North America, Inmarsat is launching an S-band satellite payload that will provide hybrid satellite-terrestrial service in Europe. Gogo’s ATG and ATG-4 ground-to-air network features 225 cell sites in the United States, with more to come in 2015 and 2016, plus 12 in Canada. Inmarsat will be installing 200-odd sites in Europe to prepare for its EuropaSat S-band satellite payload. Inmarsat Chief Executive Rupert Pearce, in a March 5 conference call with investors, said the EuropaSat project is on schedule for a late-2016 launch aboard a SpaceX Falcon rocket, meaning full service by sometime in the first half of 2017. 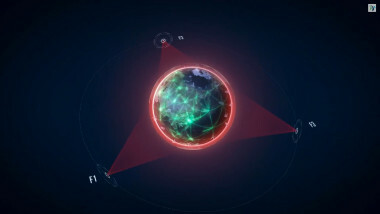 Inmarsat will be spending some $200 million on the S-band terrestrial ground network. Pearce said part of the EuropaSat business model is based on projections that, by 2020, the European short-haul aviation market, now growing faster than the larger North American market, will be the larger of the two, with 6,000 planes flying each day.